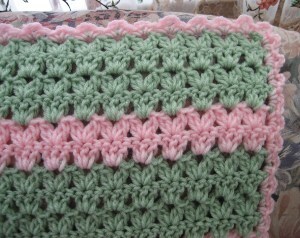 This crochet shell stitch afghan is great for babies and adults alike. 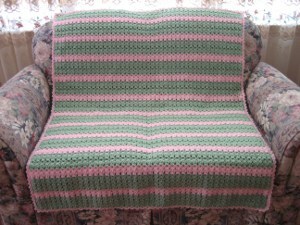 Made with soft pink and green yarn, this Watermelon Afghan is just the thing for adding a touch of summer into your home decor. The shell stitch that makes up this crochet afghan pattern is easy to master and gives your crocheted afghan a soft texture that both babies and adults will appreciate. Cluster (cl): Yo, insert hook in indicated place, yo, pull loop through, yo, pull through 2 loops on hook, yo, insert hook in same place, yo, pull loop through, yo, pull loop through 2 loops on hook, yo, pull through all 3 loops on hook. Shell: (cl, ch 3, cl) in indicated place. Row 1: With honeydew ch 142, 3 dcs in 5th ch from hook, [skip 2 chs, 3 dcs in next ch] across to last 2 chs, skip 1 ch, dc in last ch, turn. Row 2 (RS): Ch 3, Shell in center dc of each 3 dc group across to last st, dc in 3rd ch of beginning ch 3, turn. Row 3: Ch 3, 3 dc in ch space of each Shell across to last st, dc in 3rd ch of beginning ch 3, turn. Row 4: Ch 3, Shell in center dc of each 3 dc group across to last st, dc in 3rd ch of beginning ch 3, fasten off and turn. Row 5: Join baby pink with a slip stitch in first st, ch 3, continue with Row 3. Row 6: Repeat Row 4, fasten off and turn. With baby pink work along top edge (sc, ch 3, sc) in first right corner dc, (sc, ch 3, sc) in each ch 3 space across, (sc, ch 3, sc) in last dc. Work along side edge (sc, ch 3, sc) in each side dc across, (sc, ch 3, sc) in first bottom ch. Work along bottom edge (sc, ch 3, sc) in each ch below 3 dc group, (sc, ch 3, sc) in last ch. Work along side edge (sc, ch 3, sc) in each side dc across, join to beginning sc and fasten off. Now here is an easy looking crochet project that I might like to do. I like easy, but I lose interest after a while, I think that this pattern provides enough changes especially with the colors to keep me interested for the duration of the project. It is pretty in the picture, but I wouldn't say those are watermelon colors, as they seem too pale on the screen. Very pretty,looks easy to make,will have to try it.